Job estimates are often difficult to predict because month-to-month variances can swing wildly. However, census firing is about to take back another chunk of census hiring and I expect another bad looking jobs report this month. Interestingly, Geithner is making excuses in advance. Perhaps people start looking for jobs, but there certainly is no sign of it. If it happens this month, in the face of census firings, the unemployment rate could potentially soar. Bear in mind that it takes between 100,000 and 125,000 jobs a month to keep up with demographics (birth rate plus immigration). The net of that is +652,000 jobs in six months, approximately enough to keep the unemployment rate flat for the year. Instead, the unemployment rate dropped along with the participation rate. Had the participation rate risen (more people looking for jobs than giving up), the unemployment rate would be closer to 10.5%. The massive increase in the participation rate between 1960 an 2000 is a result of single wage-earner households going to dual wage-earner households (both husbands and wives working), a decrease in average family size, and other boomer related dynamics. Now, as boomers head for retirement we can and should expect the participation rate to decline. However, I took that into consideration with my estimate that it takes 100,000 to 125,000 jobs a month to keep up with birth rate and demographics. In 2000, the number was close to 150,000 a month. Bernanke's estimate is 100,000 jobs a month. However, I think he is slightly low-balling for obvious reasons. Regardless, we are both in the same ballpark. Clinton not only had far more favorable demographics to work with than either Bush or Obama, he also happened to be president during the midst of a genuine productivity boom, falling commodity prices, and an internet revolution that created millions of jobs. In terms of job creation, Clinton was lucky. That combination will not be seen again for decades and he did not have to do anything to get it. However, one must play the hand one has been dealt, and to show I am not taking partisan sides, Bush and Obama have both blown it with misguided policies and stupid wars. 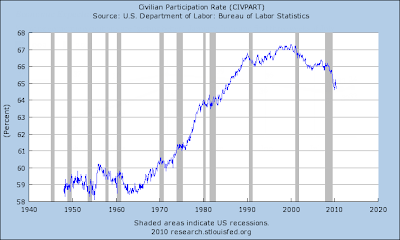 Let's zero in on the participation rate since 2000 to see what trends suggest. 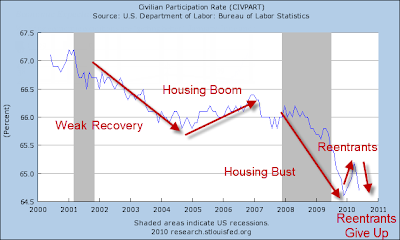 The above chart shows the effect of the Greenspan induced housing bubble. Even though housing peaked in 2005, commercial real estate temporarily picked up where residential housing left off. That combination kept employment high with countless Home Depots, Lowes, Pizza Huts, etc, adding jobs for two years even as housing went into a tailspin. This all ended in late 2007 with a thunderous crash of housing, commercial real estate, commodities, and the stock market. In late 2009, the participation rate rose as people who thought there might be jobs, started looking for them. It was a mirage. As people exhausted their unemployment benefits, they gave up and instead started collecting social security. Note that as soon as someone stops looking for a job (even if they want one), they are not considered to be unemployed, nor are they a part of the labor force, thus the participation rate drops. To accurately predict trends in unemployment, one not only needs to estimate the number of jobs the economy will create (or lose), one has to get boomer dynamics and the participation rate as well. Ironically, one can be wrong on both estimates and still come out OK if the forces balance out. If the participation rate jumps now, so will the unemployment rate. If jobs decline and the participation rate jumps, the unemployment rate will soar. To make substantial progress on the unemployment rate, it will take continuously rising jobs (substantially above 100,000 a month), and a falling participation rate. Not to blow out any recovery candles, but that combination is highly unlikely. Looking ahead, the jobs picture appears bleak. The best of this recovery is over: Corporate Hiring is No Longer Improving and Americans are Less Optimistic. Geithner is making excuses in advance, hoping for a miracle that is unlikely to come.